Advanced barcode report item available for SQL Server Reporting Services 2005, 2008, 2008R2, 2012 and 2014. Nevron Barcode for SQL Server Reporting Services (SSRS) is designed to provide report authors with an easy and powerful way to create linear and matrix barcodes that are tightly integrated with the data. 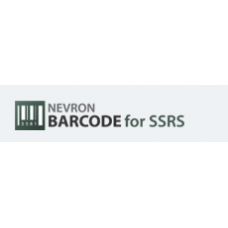 If you're looking to integrate barcode visualization inside your reports then Nevron Barcode for SSRS is a perfect choice. It can display virtually all widely used barcode symbologies and is fully data-driven. Nevron Barcode for Reporting Services supports unlimited number of barcode areas. Each barcode area can display a different barcode symbology and the areas can be automatically or manually arranged. Nevron Barcode for Reporting Services supports unlimited number of titles which can be manually positioned or docked to barcode or barcode areas. Nevron Barcode for Reporting Services supports saving and loading templates. Save the barcode state from the designer to XML and then import it in in a different report item. The state generated by the VS2005, VS2008 and VS2010 report items is compatible meaning you can easily convert reports generated with different versions of Visual Studio.